Kwong Shin Optical store is located within Singapore’s Bras Basah Complex, at 231 Bain Street. Established in 1976 and within Bras Basah Complex since 1980, Kwong Shin Optical provides eyewear products and optical services. The range of services & products includes eye exams, prescription glasses, sunglasses, contact lenses, lens replacements, adjustments & repairs, solutions, and accessories. Among the eyewear brands available at the shop are Perfect Number, Dior, Gucci, Prada, Mykita, Yellows Plus, Masunaga, Oakley, Vogue Eyewear, Hanae Mori, Elza Winkler, Viktor & Rolf, BCPC Eyewear, Saint Laurent, as well as Stealer Eyewear. 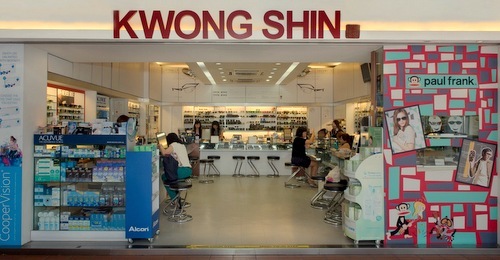 The official Kwong Shin Optical Facebook brand page is located at www.facebook.com/kwongshin/. Following the Facebook page, you’ll get updates about the shop’s eyewear products, their events, plus more.